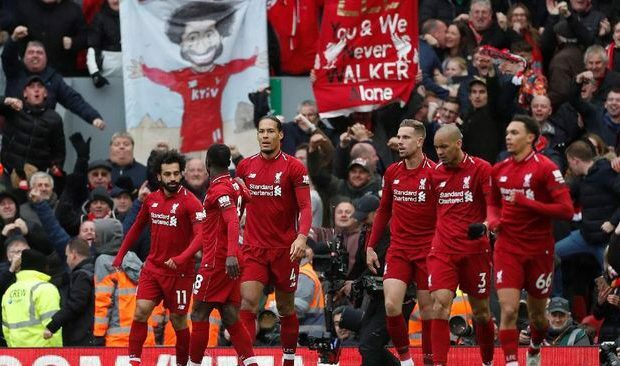 Liverpool maintain the opportunity to win the Premier League title 2018/2019 thanks to the solid and neat appearance displayed by all players including Mohamed Salah. Chelsea is arguably the toughest opponent of Liverpool in the final match of the season in the context of the title race with Manchester City. Facing London rivals, Juergen Klopp did not choose the option of rotating players on a large scale despite Liverpool’s schedule in the Premier League squeezed in the first leg and quarter-final second leg against FC Porto. The composition of the core players displayed by Klopp in the match against Chelsea is only two players different than when they hosted Portugal’s representative in the middle of last week. Andy Robertson and Joel Matip entered the starter as substitutes for James Milner and Dejan Lovren. These conditions imply Liverpool have the same ambition to achieve glory in the domestic league that they have never achieved for 29 years as well as success on the European stage. Playing with the main players, Liverpool immediately launched a collective playing style in attack. Facing the host’s attack, the visitors had tried to anticipate by relying in counterattack on the ability of the back line quartet and midfield quality to flow the ball quickly. But the aggressiveness of the players in red uniforms made it difficult for Chelsea to extinguish the attacks of opponents who came in stages. Despite being able to release the threat of a counterattack, the Blues seemed far from comfortable in wading 2×45 minutes. The performance of N’Golo Kante, which was not supported by Jorginho and Ruben Loftus-Cheek, made Chelsea lose in midfield to Naby Keita, Fabinho and Jordan Henderson. A goal recorded by Sadio Mane in the 51st minute was inseparable from the intensity of the attacking game Liverpool had launched since the second half whistle sounded. Movement and bait combination of Liverpool players failed to stop by Chelsea, so Mane opened the scoring. Not yet shocked by Mane, Mohamed Salah, who appeared as the creator of a key pass on the first goal, then came up with an accurate long-range strike that made the ball nestled in the Kepa Arrizabalaga goal for the second time. Chelsea tried to get up through the movement of Eden Hazard which produced two golden opportunities. The goalpost and Alisson Becker were a barrier to prevent Hazard’s goal in the Premier League. After winning two goals, Liverpool slightly reduced the appetite for attack so as to give a little breath for Chelsea. Nevertheless, Fabinho and his friends are still able to produce opportunities. If Kepa is not alert, a bigger score can be created at Anfield. Facing strong opponents, Sarri once again maximizes the presence of Hazard as a pillar. The individual action of the Belgian player has indeed troubled Liverpool players. But the game of collecting 18 Premier League titles that make players such as layered give a chance means that for the prepared Hazard to be a false nine. As a team, Liverpool deserve to be a winner. More mature team games are key besides the brilliant performances shown by Salah. The best African player in the last two years has been one of the players who stole the attention in this match. In addition to hair that is characteristic so easy to recognize, Salah who are undergoing a second season with Liverpool really have a share in the victory. One key pass and one goal are the markers of Salah returning to his best performance. Five shots with three towards the goal and one produced a goal were valid proof of Salah involvement in a Liverpool attack that could be easily witnessed directly. In addition, Salah also became the second player after Eden Hazard was successful in dribbling. Of the ten attempts to pass the opponent, four times Salah managed to trick players who escorted him. Being crushed by Chelsea supporters as bombers, it is wrong to prove the quality on the field. The movement on the wing side made Emerson hurt. Apart from his individual actions, the 26-year-old player also worked hand in hand with Mane and Roberto Firmino. Not only that, Salah also displayed solidarity in playing by coming down when Liverpool were attacked including guarding opposing players who dribbled. Fasting scored for two months or eight matches in a row in the Premier League, Salah again became a talisman for Liverpool to keep their chances of becoming champions.